The technologies in the first group strengthen the capacity to process data and information. Technology including the Cloud, Internet of Things technologies, and sensors which all enable interconnectedness, are some examples. In a world where everything is connected to the internet, cyber security solutions become increasingly important. The second group consists of technologies that strengthen the capacity to gather and analyze information. For example, advanced analytical technologies, deep machine learning technologies, big data technologies, and artificial intelligence can be included in this group. In other words, much more information can be gathered, rapidly processed, and analyzed in various ways due to the technologies in the first two groups. The concept known as Industry 4.0 or, the fourth Industrial Revolution, is a natural extension of the technological evolution that has been going on for years. Those in the third group are technologies that facilitate human interaction with machines and make it more effective. New-generation user screens, virtual reality, and enhanced reality technologies are included in this group. Some believe that the aforementioned technologies will take human interaction with robots to unprecedented levels, driving us towards the fifth Industrial Revolution. The last group of technologies can be defined as technologies that fabricate products from digital models. For example, 3D printing machines convert digital data to physical output (products) using materials such as metal, plastic, and even fabrics. Although they can be grouped in different ways, when discussing the digital transformation, we are referring to technologies that generate, collect, process, and analyze massive amounts of data, as well as technologies that strengthen human interaction with machines and convert data into physical products. These four technology groups are growing and expanding at an unprecedented pace. A study conducted by Cisco for example, found that in 2013 there were 10 billion machines and devices communicating with each other. The study predicted that advances in data and information processing capacity and information networks would raise this number to 50 billion by 2025. A study conducted by international research organization, IDC, revealed that the amount of data generated globally from 2013 to 2020 would rise 11-fold to 44 zettabytes. Every piece of data that is generated but cannot be used in a meaningful way is now considered waste. The market for virtual and enhanced reality applications is also expected to grow five-fold by 2020, reaching a value of 100 billion dollars. As a result, human interaction with machines will soon be become a reality. By 2020, there will be three million industrial robots working in factories alone. The prevalent use of these technologies in the industry is not the only reason that they have advanced and spread so rapidly. Experts predict that Internet of Things technologies will have an impact of up to trillions of dollars, in areas ranging from health and transportation, to construction and retail sales. For example, according to a study conducted by the McKinsey Global Institute in 2015, Internet of Things technologies are expected to have an annual economic impact of 11 trillion dollars by 2025, 40 percent of which will be in manufacturing. Technology is transforming not just the manufacturing sector but many others as well, and is affecting every segment of society. In cities, for example, Internet of Things technologies are expected to have an economic impact worth 0.9-1.7 trillion dollars by 2025. It is predicted that just the benefit provided by smart traffic management systems will amount to approximately 500-900 billion dollars per year. Digital technologies are expected to have a significant impact on various sectors. For example, the global digital health market will grow to 233 billion dollars by 2020, while the agricultural robotics market is expected to approach 20 billion dollars in the same time frame. Digital technologies and advanced production technologies also have the potential to significantly increase the efficiency of manufacturing industries and their competitive edge. The smart manufacturing technologies currently in place have the potential to increase the efficiency of the manufacturing industry by an average of 3-5 percent. These technologies can reduce the amount of time machines remain idle by 30-50 percent. Furthermore, advances in robotic technologies can increase labor force productivity by 45-55 percent by having robots perform both dangerous and routine tasks. Many countries have started taking concrete steps with regard to the digital transformation of the manufacturing industry. For example, the EU announced its strategy for the “Digitalization of European Industry” as part of the “Digital Single Market Strategy” in 2016. The US recently launched an initiative called “Made in America,” of which the primary objective is to bring the manufacturing industry that began leaving the country in the 1970s back to the US. It appears that this trend will continue to grow stronger during the Trump administration. The Industry 4.0 concept first emerged in Germany, where the platform was created as a cooperative effort between the industry, academia, and the private sector. This platform engages in work on common use and benefit, particularly to facilitate the digital transformation process for small and medium-sized businesses (SMBs). Moreover, China’s “Made in China 2025” strategy aims to transform China’s low added value manufacturing into high added value manufacturing. When considering the extensive impact of the fourth Industrial Revolution, it is clear that it will be a critical phase for our country. One of our priorities is to increase Turkey’s exports of medium and high-tech products and achieve the EU average. Turkey’s manufacturing industry is numerically dominated by SMBs, although it will be much more difficult for this group to adapt to the digital transformation process than it will be for large corporations. For example, according to 2015 data from the Turkish Statistical Institute, only 12 percent of SMBs – businesses that employ 10-249 employees – order products or services via computer networks. In 2014, our manufacturing enterprises created an added value averaging 190,000 euros. This is less than one fourth of the average in the EU. Our manufacturing businesses create less than one tenth of the added value created by German manufacturing. When addressing the issue in terms of workforce efficiency, we see a similar picture. The added value created by our employees in manufacturing is one third the EU average, and one fourth that of Germany. As a result, the efficiency of our industry is much lower than that of EU countries. The fourth Industrial Revolution could not only close this gap, but also make the gap wider if we do not take timely measures. It will be impossible for us to achieve sustainable growth without manufacturing. The digitalization of our industry will have an effect on and contribute to the growth of our manufacturing. Approximately 30 percent of our manufacturing and 37 percent of our exports consist of medium and high-tech products, while medium and high-tech products comprise 63 percent of EU exports. One of our priorities is to increase our exports of medium and high-tech products and achieve the EU average. 10 percent of the difference is in medium-tech and 16 percent is in high-tech products. High-tech sectors are those most affected by digitalization. Therefore, it is absolutely essential that we digitize our industry in order to increase our high-tech manufacturing and exports. Labor force markets will also be affected by the fourth Industrial Revolution, as digital and advanced manufacturing technologies have the potential to render many jobs and professions obsolete. The most important capital in the new era will be educated and qualified human resources. Therefore, it is critical that we create a qualified labor force that has the competencies required today and can design and manage their own systems as a contribution creating a competitive workforce in Turkey. Our Ministry will conduct a detailed study of how the fourth Industrial Revolution will affect Turkey’s employment. We also expect the fourth Industrial Revolution to affect the flow of global trade. As I stated earlier, the spread of advanced manufacturing technologies such as layered manufacturing technologies and trade — which went global during the third Industrial Revolution — will begin to be rapidly regionalized, at least in certain sectors. For example, Adidas has brought the manufacturing of shoes back to Germany after 30 years by building a smart factory. It has been said that the company also plans to open a similar factory in the US. Therefore, although Adidas has produced its products in Asia and exported them to Europe and America for the last 30 years, it will now manufacture them in Europe and the US. All of these developments clearly demonstrate that our industry is at a fork in the road. If we do not invest in smart manufacturing systems or if we delay these investments, our low added value manufacturing trend will remain largely unchanged, which means that we will lose our competitive edge. The result will be that our share of the global market will quickly erode and our manufacturers will also begin to struggle in the domestic market. Producing and utilizing smart manufacturing systems will facilitate our transition to high value-added manufacturing and help increase our country’s competitive edge in a sustainable fashion. We have developed a model based on public-private cooperation to accelerate the process of digital transformation in the industry and established the Digital Transformation Platform in Industry, of which the preliminary meeting took place at the end of 2016. Under the leadership of Ministry of Science, Industry and Technology, the platform brings together TOBB, TİM, TÜSİAD, MÜSİAD, YASED, and TTGV, and we created six working groups focused on our country’s priorities. TOBB will lead the “infrastructure” working group, which will outline our country’s technological and physical infrastructure needs and the steps that need to be taken. The “Open Innovation” working group led by TİM will address the issues of creating and strengthening platforms and an environment of cooperation that will ensure we develop technology. TÜSİAD will focus on the issue of “digital technologies in industry.” It will identify our needs in this area and work on measures that will ensure our businesses both use and create more digital technology. MÜSİAD will work on “advanced manufacturing techniques” and identify our needs in this area. As a result of this work, we will identify measures that ensure our businesses use an increasing number of advanced manufacturing techniques and produce more advanced manufacturing technologies. The working group led by YASED will focus on issues such as standards, legislation, and intellectual property rights. Finally, the working group led by TTGV will address the issue of education in order to create a workforce that will pave the way for the digital transformation of our industry. At the end of this year, our goal is for the working groups to publish a report of their work and prepare a road map. As we see from the structure and purposes of the working groups, the foundation of our strategy for digitizing our industry is to position Turkey so that it produces its own technology rather than importing ready-made technologies, and that it effectively utilizes these technologies. In order to achieve the digital transformation of our manufacturing industry, we must on the one hand, strengthen our capacity for generating technology, and on the other hand, pave the way to digital transformation for our businesses. Within the framework of these two strategic goals, we plan to continue our work taking into consideration aspects of competency, financing, and infrastructure. If we do not invest in smart manufacturing systems or if we delay these investments, our low added value manufacturing trend will remain largely unchanged, which means that Turkey will lose its competitive edge. When it comes to developing competencies, we will develop enterprise and professional competencies that will ensure we not only produce technology, but use it in the most effective way. As for financing the transformation, we will ensure that digital technologies and advanced manufacturing technologies are developed by providing more focused support for R&D and innovation. On the other hand, we will assist the digital transformation of our industrial organizations, especially SMBs. Similarly, strengthening infrastructure will include both the development and the use of technology. We must also develop a sectoral perspective in this endeavor. Digital technologies and advanced manufacturing techniques will impact different sectors in different ways. The impact of digital transformation will not be limited to our industry, industrialists, and industrial workforce, but will have a significant effect in every area of our lives and every individual. Our industry is at an important fork in the road. If we do not produce technology or fail to effectively utilize technology, our technology deficit will grow, which means our current account deficit will continue to rise. In the first quarter of 2017, Turkey achieved important success by growing by five percent. Increased domestic demand as well as our exports played a key role in this growth. As the locomotive for growth, the industrial sector determined both the direction and pace of growth. In this new era, we expect our industry to achieve a very high sustainable growth rate. In addition to the initiative we have taken in connection with the fourth Industrial Revolution, every article in the Manufacturing Reform Package recently put into effect by our Ministry includes important regulations that will remove the obstacles faced by our industrialists and encourage production, exports, innovation, and R&D. The package was prepared in consultation with all of the stakeholders in industry and production, and will be a turning point in the future of industry in this country. This Manufacturing Reform Package was drafted with an understanding of the fourth Industrial Revolution for the purpose of meeting technological needs. I would like to add that the new Industrial Property Rights Law that we passed has harmonized our regulations with the world’s most advanced countries in this regard. With increased R&D expenditures, we intend to create an industrial infrastructure that produces our own technology. All of our stakeholders have important tasks and responsibilities in this area. Our manufacturers must fully understand consumer needs, develop strategies for technological advance, and design new business models and organizational structures compatible with the digital world. At the same time, companies in the manufacturing sector in particular and the real sector in general need to stay abreast of developments so that they can adapt to this new process. The most important issue is that companies have the foresight and the road map that they need. It is essential that this new road map be drawn up by each company based on its own dynamics and that expectations as well as sectoral and global developments be analyzed properly. We are delighted to see that our industry is keeping up with this process because our private sector is extremely dynamic, open to change, and focused on growth and technology. Our policies including agriculture, health, education, the environment, energy, and transportation. need to be updated and reshaped in light of the fourth Industrial Revolution. This is only possible with a vision shared by all of the concerned segments because the impact of digital transformation will not be limited to our industry, industrialists, and industrial workforce, but will have a significant effect on every area of our lives and every individual. Turkish Industry and Business Association (Türk Sanayicileri ve İşadamları Derneği – TÜSİAD); Union of Chambers and Commodity Exchanges of Turkey (Türkiye Odalar ve Borsalar Birliği – TOBB); Turkish Exporters' Assembly (Türkiye İhracatçılar Meclisi – TİM); Independent Industrialists and Businessmen Association (Müstakil Sanayici ve İşadamları Derneği - MÜSİAD); International Investors Association (Uluslararasi Yatirimcilar Dernegi – YASED); Technology Development Foundation of Turkey (Türkiye Teknoloji Geliştirme Vakfı – TTGV). 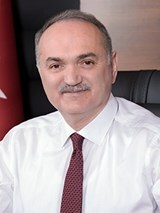 Faruk Özlü is the Minister of Science, Industry and Technology of Turkey from the Justice and Development Party (AKP).